This month I attended the Eyes of Learning Fall Festival. It's Long Island's oldest non-profit metaphysical organization. 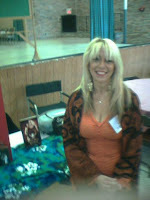 I had worked at these fairs years ago doing psychic readings and this time I was there selling my book, and music. I had a wonderful time and look forward to the Spring Fair. I was able to see friends that I haven't seen in a long-long time. Next time I may even do some readings. Yay for you on the fair! It's always interesting to look back at something like that and say that you've "graduated" I guess the word would be. Not the doing readings is any less than promoting a book, I find them quite equal but more like taking a step on the same stair. You're no better or worse than where you were before, just in a different place with a different view. I hope this fair did you well for your book though! Actually, if you're feeling up to it, I could use your help. I'm writing what very may well be a series about a Brooklyn psychic and to have your input on the matter would help me a lot! Having something to draw from when it comes to the dynamics of that world would be great. Now that I've never been exposed to it as we have psychics up here but to get that long Island edge that I need is key. If you want, take a look at my blog, all of the information about the novel is in the sidebar and if you're willing to, say, do an interview, I would be eternally grateful!